The Clinton Community School District teachers and staff started off the school year by having Clinton Police, Fire and EMS give a presentation called ‘Casualty Care in the Classroom.’ Through this program, CCSD staff were taught what to do in an emergency situation, from how to pack a wound to how to block a classroom door from an intruder. 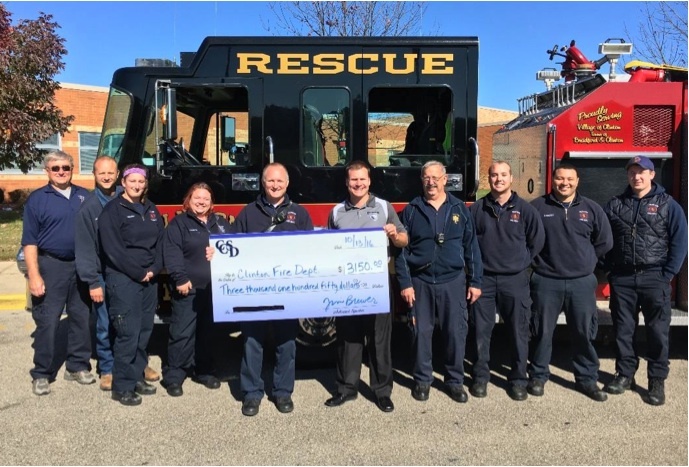 To show our continuing support for all that First Responders do for our schools and our community, District Administrator Jim Brewer challenged the staff to raise $600 to purchase one set of tactical response gear for the Clinton Fire and EMS. Rising to the occasion, staff, students and parents raised $3,150, allowing for five sets of safety gear to be purchased. Each school held fundraisers to try and beat the other schools. The Clinton Elementary School held a “Hat Day” where students and staff paid $1 to wear a hat. Donation jars were also put out at Conferences. The Clinton Middle School also held a “Hat Day” and “Penny Wars,” challenging the 5th, 6th, 7th and 8th graders to raise more than the other classes and their teachers. Teachers were also invited to participate in “Dollars for Denim” and pay to wear jeans to school. Finally, the Clinton High School held “Hat Day” and “Dollars for Denim,” plus a “Penny War,” pitting the 100 hallway staff against the staff in the 200 and 300 hallways. SUBMITTED PHOTO – The Clinton Topper. Clinton faculty, staff, students and parents raised $3,150 for the Clinton Fire Dept., allowing for five sets of safety gear to be purchased. The students and staff of Clinton Community Schools know that supporting the community makes all of us better and stronger.